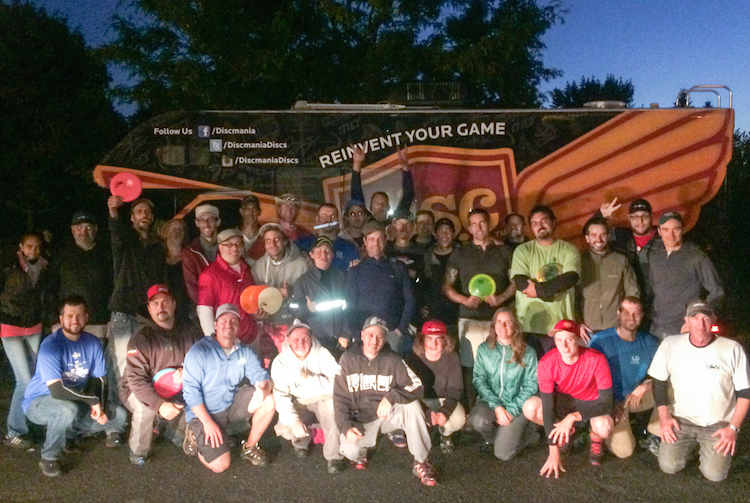 The Discmania Deep in the Game US Tour is back in full swing as it was a very successful journey to Europe again this time around with over 25+ clinics throughout Germany, Czech Republic, Austria, Finland, Sweden and Iceland! On this US Tour we decided to voyage throughout the Northern States including the Midwest, Canada, the Northeast and the East Coast...the Disc Golf Clinic requests continue to roll in as there’s a obviously huge demand for proper Disc Golf instruction. The growth of this great sport continues to impress me as we have traveled to out stretched destinations and it’s presence is very strong within the local community. The first expedition took place as I took the Discmania “Maniac” Motorhome all the way from Seattle, Washington following the World Championships in Portland 2,000+ miles to Madison, Wisconsin for a set of clinics at the Glide Disc Golf Pro Shop on location of the Heistand Disc Golf Course. I then traveled to Ohio for clinic in my hometown as it provided a very welcoming experience, it’s always great to visit home for a quick battery recharge before getting back out on the road. We then started the adventures to the north traveling throughout Rochester, Buffalo, Toronto, Montreal and back into the states for our clinics in northern Vermont. The swing through New York provided us with good sense of how the rest of the tour was to progress with the popularity of the sport showing in the great attendance at those events. I think that the trip up through Canada in Toronto and Montreal was the most impressive as many players were showing up just to spectate our practice rounds to watch us throw their local courses. All of these clinics were some of the first to completely sold out when this tour was announced, the passion shined through with appreciation and gracious applause after these awesome Disc Golf sessions. The force is strong with these Disc Golf Communities as the sport has noticeably grown in size compared to when I was traveling through these parts of the country last year. Maine is a destination that we don’t get to very often before the PDGA National Tour keeps us closer to the center of the country, plus there are very few PDGA sanctioned events up this way. But I have a great feeling that’s going to change very soon. We got the incredible opportunity to check out the highly renown Sabattus Disc Golf Course Complex with four courses on the same 100-acre piece of privately owned property. It’s been a course that I’ve heard about and seen many photos of for some time, it was long over due for a visit to finally play the courses that I’ve heard so much about. I was thoroughly impressed by the professionalism of the entire complex and the on-site Disc Golf Pro Shop, it was evident that a lot of time and passion went into building such a facility for the local players. Peter Ruby, the owner of Sabattus Disc Golf, is a huge advocate and he sees the big picture on how to improve the image of the sport by making it a destination for players of all ages and skill levels, a true Disc Golf Paradise. His vision is very obvious as he’s trying to create something very special with no detail overlooked and this course is definitely setting the standard for all of the other courses in the area of how a Disc Golf Course should look and operate. Thanks to Peter for all that you do to better the sport throughout Maine and I expect to hear about the amazing progress. The Tour has been a highlight based on clinics and including several of the Biggest Tournaments along the way. Simon has been incredibly consistent each and every weekend as he constantly puts himself in position to win going into the closing holes. I’ve be impressed by his demeanor on the course as he always offers a very calm emotion and professional attitude. When I look back at his performances he took two huge second place finishes the last couple of weeks on some miraculous shots on the final holes by his competitors, very unlikely shots that were tough to witness. But he’s learning the very important lesson of “Learning how to Win” which usually the very last thing to acquire as a professional player, it’s never over until it’s actually over! Our journey continued down the East Coast visiting Boston, New York, Philadelphia, Washington DC and down to Charlotte for the United States Disc Golf Championships in Rock Hill, South Carolina. It’s been awesome to visit these scenic destinations as it was great to see Simon’s reaction to the Big Apple and Times Square! Please make sure to follow our adventures through Discmania - Deep in the Game on Facebook and tour photos on @deep_in_the_game on Instagram. Simon keeps his blog here. The first round of the USDGC was played today. Follow the tour site, the live stream provided by the DiscGolfPlanet.tv and the event leaderboard!